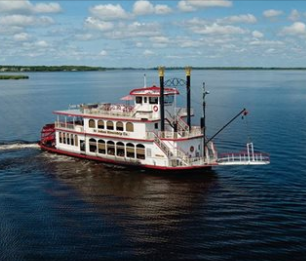 The Rivership Barbra-Lee is the only authentic sternwheeler sailing the St. Johns River. This is a River Boat Cruise with Lunch being served on the boat. This is a full day excursion that will give you memories that will last a lifetime. The trip will start at the Sebring Historical Society and you will be transported on an Annett Bus to the River Boat on the St. John's River where we will cruise the river and have lunch. Then we will return to Sebring via Annett Bus. The cost is $99.00 per person for Members of the Sebring Historical Society and $119.00 for non-members. You may join and save the $20.00 per person. Tickets sales are through the Sebring Historical Society and will be sold until January 3rd. We accept Cash, Check and Credit Cards for payment. The Sebring Historical Society is open Tuesday to Saturday 10:00 am to 3:00 pm phone number (863) 471-2522 and the address is 321 West Center Ave, Sebring, Florida.